Most of the trail today was in the trees. Kind of boring, really, but easy. August 10: Once again, Amanda would not allow me a day of rest. Before I hit the trail, however, I did some grocery shopping, setting up two 'food banks' for myself. 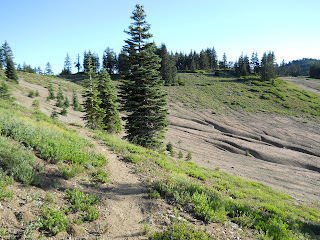 The first to get me to Crater Lake. The second to be mailed ahead to Crater Lake. I didn't expect it to take me more than a couple of days to reach Crater Lake, so I wanted to get the package in the mail early this morning to make sure it had plenty of time to get there. 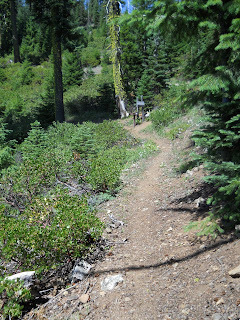 Once the necessary preparations were done, Amanda dropped me back on the trail where she picked me up the day before. Just as she was driving off, I realized that I had left my trekking pole in the car. I waved frantically trying to get her attention, but failed. No trekking pole. Certainly not the end of the world, but I felt naked without it. It was like an extension of my arm, and Amanda was driving around with my arm in the backseat. The hike itself was pretty non-eventful. My ankle still hurt to walk on from those miserable shoes I wore two days earlier, but the pain was slowly fading. Very slowly. 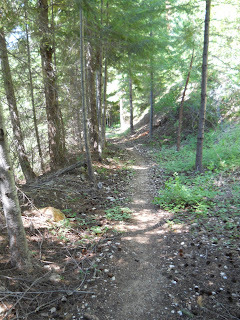 Most of the trail was in trees with the occasional view to lift my spirits. Along the way, I caught up with Double D, Red Head, Zero Zero, and Fire Marshall. The only one I knew was Red Head, though apparently I had met Double D and Fire Marshall briefly way back when. Zero Zero I'd never met before--which apparently is pretty odd since I had met Fire Marshall who was helping Zero Zero on the trail. Zero Zero was blind--thus the trail name. I'd certainly heard about him! 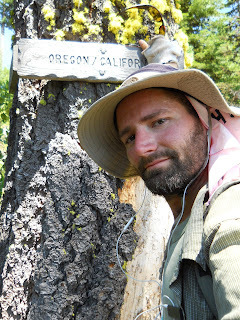 It's not often a blind person thru-hikes the Pacific Crest Trail. Ashland should be down in the valley on the left somewhere. I was a little curious about the guy but kept my questions to myself since I was sure he'd probably heard them all about a million times before. Most curiously, I really wanted to learn how blind was he--completely and totally blind, or a "legally blind" kind of definition? And I was curious about why he was blind. Blind from birth? Blind due to injury or sickness? I was told later that he's allegedly completely and totally blind. Maybe he had some sort of sense of light and dark--no one seemed sure about that point. But I was told that he could see about as well as someone who had no eyeballs at all. That's pretty blind, and it's rather remarkable he could do a thru-hike at all. I never did learn the cause of his blindness, though. As it were, however, he did have help from Fire Marshall, which is why people seemed surprised that I could have crossed paths with Fire Marshall and not met Zero Zero. I'm not even sure how that happened, but our meeting was so brief, I didn't even remember him. He just "looked familiar." A dam along the trail. I completed another short 16-or-so mile day, arriving at a road where Amanda was waiting. 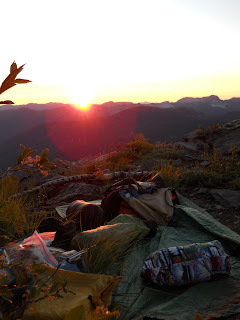 She had set out a tarp with all sorts of food and drinks for thru-hikers to enjoy and was chatting with Danny. 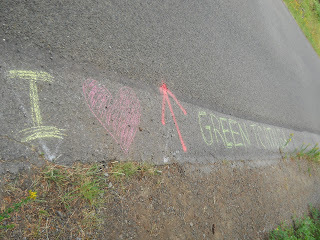 Amanda had written in chalk "I ♥ Green Tortuga" in gigantic letters on the road, which I thought was pretty amusing. 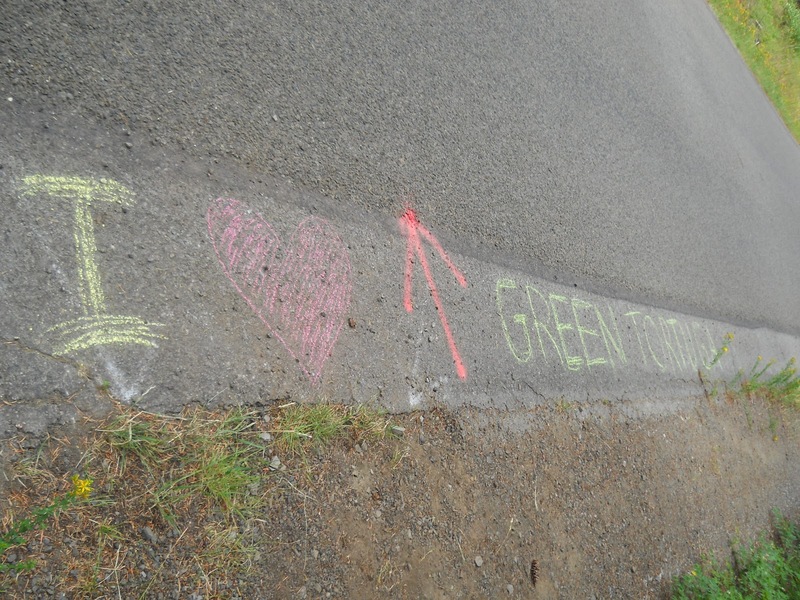 She also named several hikers who had passed by while she was waiting for me, including one that asked Amanda if she was stalking Green Tortuga, after reading the message scribbled in chalk on the road. marking the trail. Amanda wrote the rest of that in chalk, though. 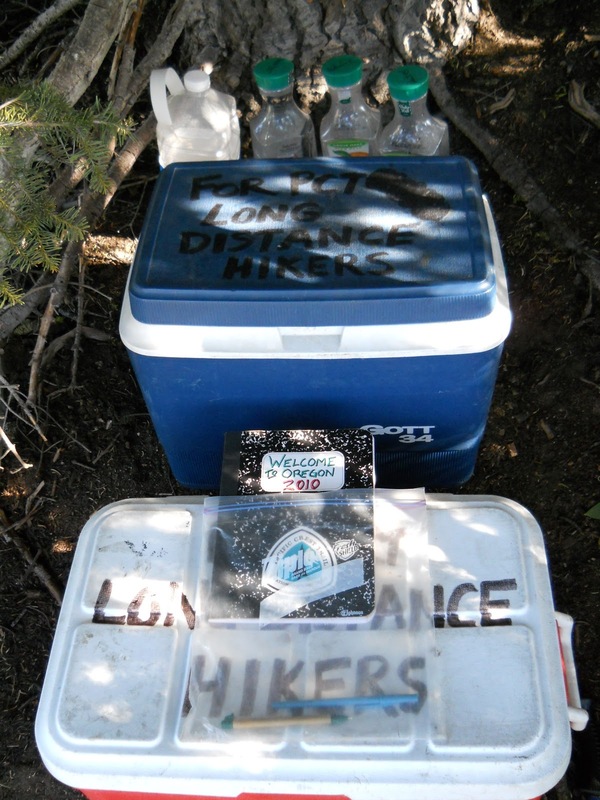 Amanda and I left four cold sodas on the trail for the four hikers we knew were behind. They hadn't arrived by the time we left, but we didn't want to leave them completely empty-handed, so we left the four sodas on the trail at the trailhead. It would be impossible to miss. Well, except for Zero Zero. He might not have seen them, but we had every confidence that the others he was hiking with would tell him. 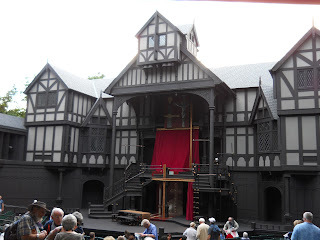 Then we drove back to Ashland where I changed clothes so we could attend a Shakespearean play. Ashland, of course, is famous for the Shakespeare Festival, and for all of the times Amanda and I had been through the town, never once had we managed to stop long enough to enjoy one of the plays the town is so famous for. Tonight, that would change! On the menu was Henry IV, Part I--a history and one I was quite familiar with from my Shakespeare class in college. We listened to some live music while waiting for the doors to open, which I enjoyed. It seems they bring people in just about every evening for free entertainment, and this evening was a symphony of high school students. At least they looked like they could have been high school students. The doors finally opened and we took our seats. I took a couple of photos, then Amanda took a photo using her flash and getting us BUSTED by an usher. Apparently, photography of any sort was not tolerated. This surprised us--even before the show started? That's just stupid. I could understand not allowing flash photography during the show, but people were just coming into the theater and finding their seats. BUSTED by the Camera Nazi. Properly chastised, we sat around, watching everyone else taking their seats. I think we had the camera Nazi usher in our section, though, since I saw many other people taking photos in other parts of the theater but nobody ever busted them for it. We saw our lady bust several others, however. Seemed very unfair. Why were there no signs warning people not to take photos? I was very annoyed, but at least I got a couple of photos (not using a flash) before Amanda attracted the camera Nazi by taking a photo with a flash. The show ended well past my bedtime, so after the show finished, we went back to our motel and went to sleep. August 8: I woke up in a hotel, but my feet and ankles were still hurting from those horrid shoes, so I lounged around playing FarmVille. Amanda wouldn't have any of that, however. No, she insisted that I had to hike. It was the Hike-a-Thon, darn it, and I'd only contributed 145.0 miles so far for the month. That just was not good enough! "No," she'd cut me off, "you have miles to hike!" So that's how I found myself, being dropped off near Interstate 5, and Amanda driving off into the proverbial sunset. It would be a short day, though. Just 16.6 miles to the next major road crossing. A short stroll. The trail passed one significant landmark along the way: Pilot Rock. 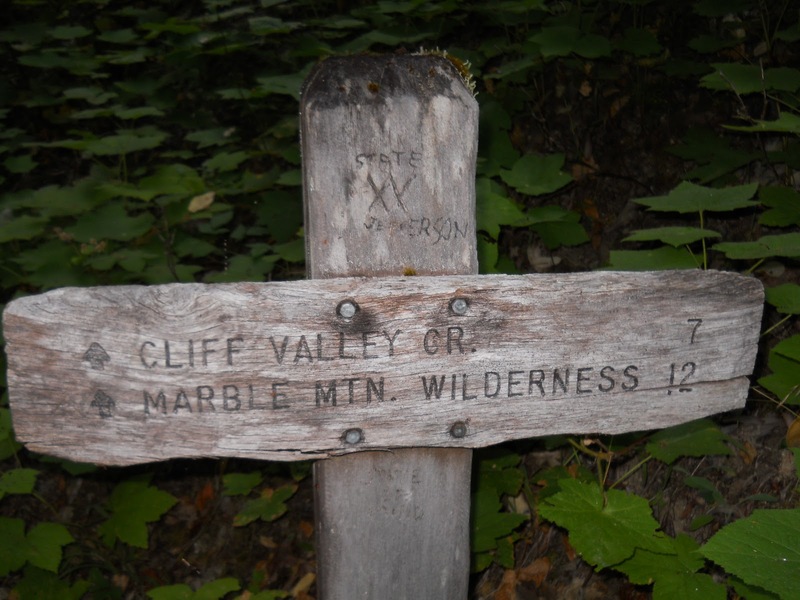 I was familiar with this landmark having read about it in William Sullivan's Hiking Oregon's History. 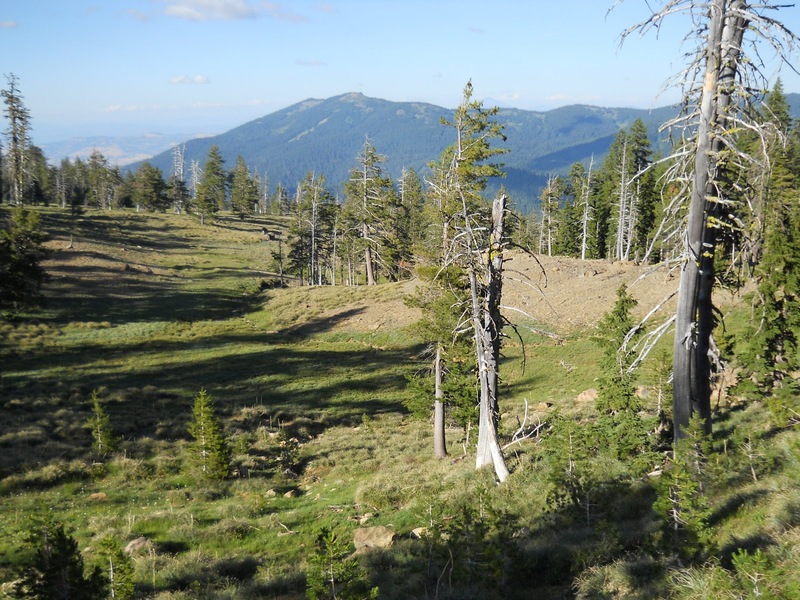 It included a few interesting tidbits such as the rock marking the easiest pass across the Siskiyous from California to Oreogn--presumably how it got its name in the first place. I actually used it for much the same purpose while driving up I-5 from California to Oregon, thinking to myself, "Yep, there's Pilot Rock. That's Oregon Country over there!" Not that I'd get lost off of I-5 had the rock not been there, but seeing it ahead was still always somewhat comforting. And once again, passing by it was somewhat comforting. Even as history fades into the distance, this rock still remains, looking the same today as it did a hundred years ago. 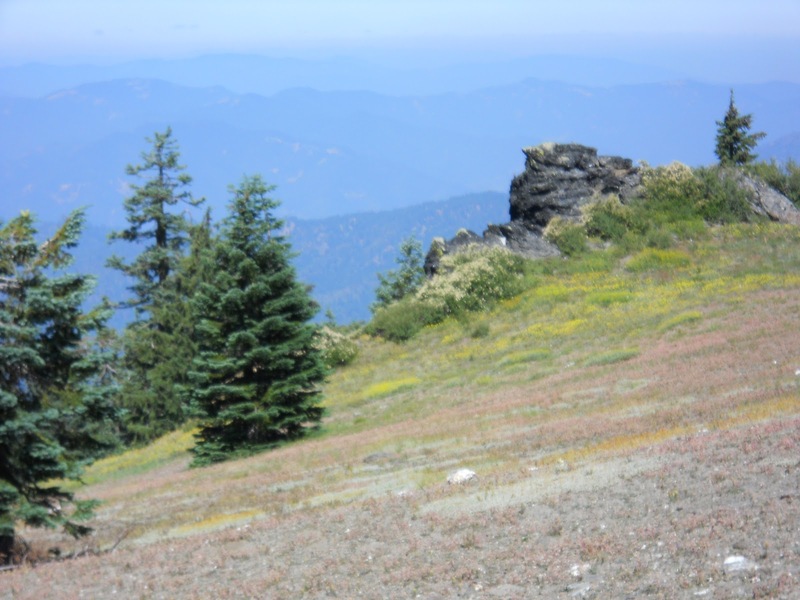 Oregon's last grizzly bear (Old Reelfoot) was killed near the base of Pilot Rock in 1890. Reelfoot seems to have been the Houdini of the grizzly world, having been caught in bear traps and shot but still managing to escape and live for 20 years, killing cattle anytime he wanted a meal. There's Pilot Rock, dominating the horizon! In the meantime, however, news of the murders outraged the nation, and police from California and Oregon searched the woods for the gunmen, but the D'Autremonts had concealed themselves under a fallen old-growth log in a gully below Pilot Rock that searches walked right by. 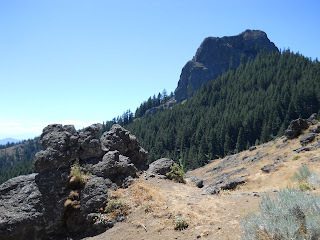 The other side of Pilot Rock. Ten days later, Ray jumped a freight train into Ashland to buy supplies and must have been surprised to see his name in the headlines. Investigators had found a crumpled money order receipt in the discarded overalls and traced it to the brothers. Millions of wanted posters in seven languages had already been distributed from Canada to Latin America and from Europe to the Orient. Oops! The brothers split up and assumed new identities, settling down in their new lives. Ray and Roy became steelworkers in Ohio, and Ray got himself married to a "pretty young wife." They weren't suspected as murderers until four years later when their younger brother Hugh was discovered as an Army private. Sullivan says he was discovered during a "routine fingerprint check," but the online sources I've been reading say that someone recognized him from a wanted poster and turned him in for the reward. Regardless, Hugh was caught, which eventually led to Ray and Roy in Ohio. They were all brought to justice in Oregon, sentenced to life in prison. Hugh won parole in 1959 but died a year later from cancer. Ray was released in 1961, and Roy died in the Oregon State Mental Hospital in 1985, hopelessly insane. was still hazy from smoke in the air. 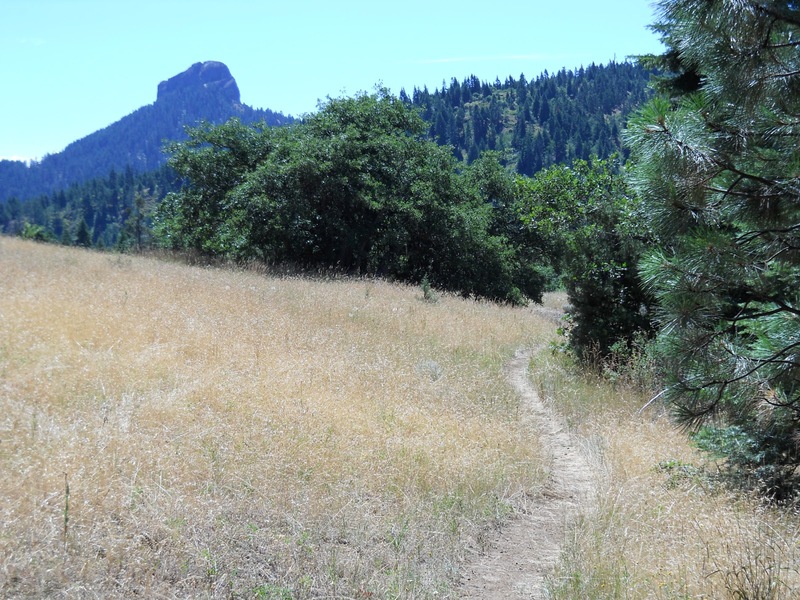 So while hiking by Pilot Rock, thoughts of early pioneers, grizzly bears, and the great (albeit failed) train robbery dominated my thoughts. 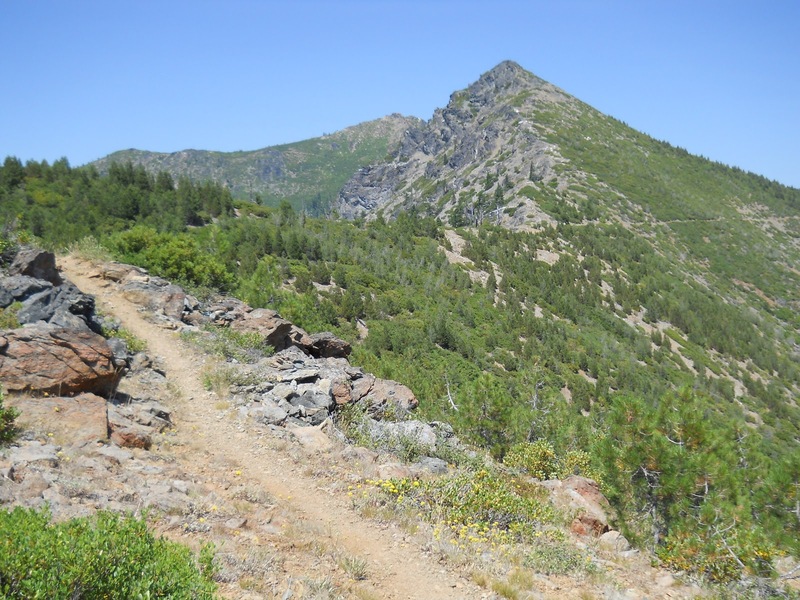 I didn't take the side trail to the top of Pilot Rock--I'd done that several years before and saw no sense in repeating the effort. I had other fish to fry! I caught up with Schroomer, Smiles, Little Engine and Plain Slice along the way. I'd never met Smiles before, but the other three I hadn't seen since near Lake Tahoe. It was nice bumping into so many familiar faces. The last couple of weeks on the trail have been remarkably empty of other hikers. Several minutes later, Motor and Max Chill caught up. I didn't pass them on the trail so they must have started off after I did, and Schroomer, Smiles, Little Engine, and Plain Slice caught up in time to enjoy some of the trail magic before Amanda and I drove back to Ashland for the night. 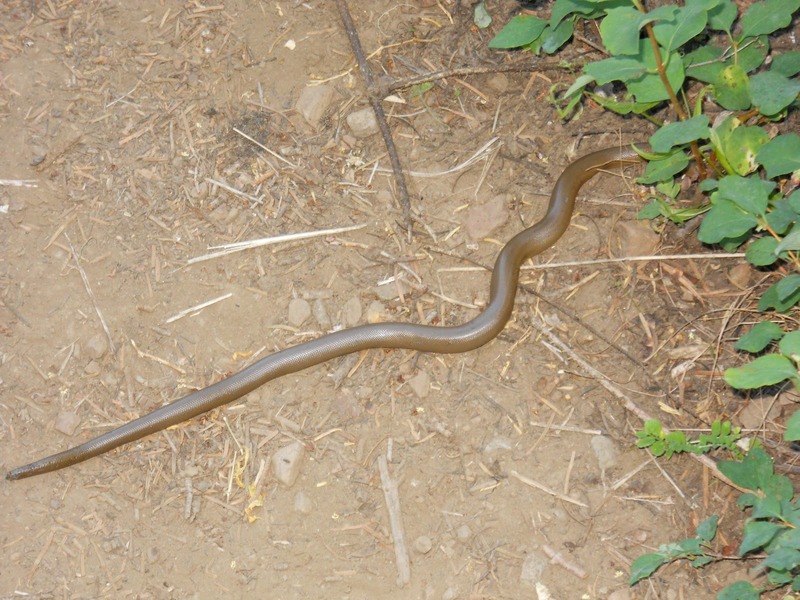 This is a creepy little snake. No idea what it is, though. That's Max Chill in the background. Smiles and Motor do some stretching exercises. O Ashland, Where Art Thou? 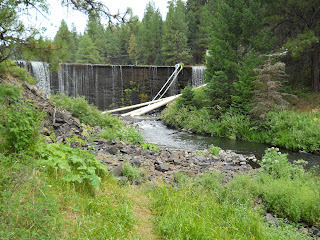 August 8: I woke up, and was pleased to find that I was still in Oregon. It wasn't just a dream! I was really in Oregon! And I'd be meeting Amanda later that morning. 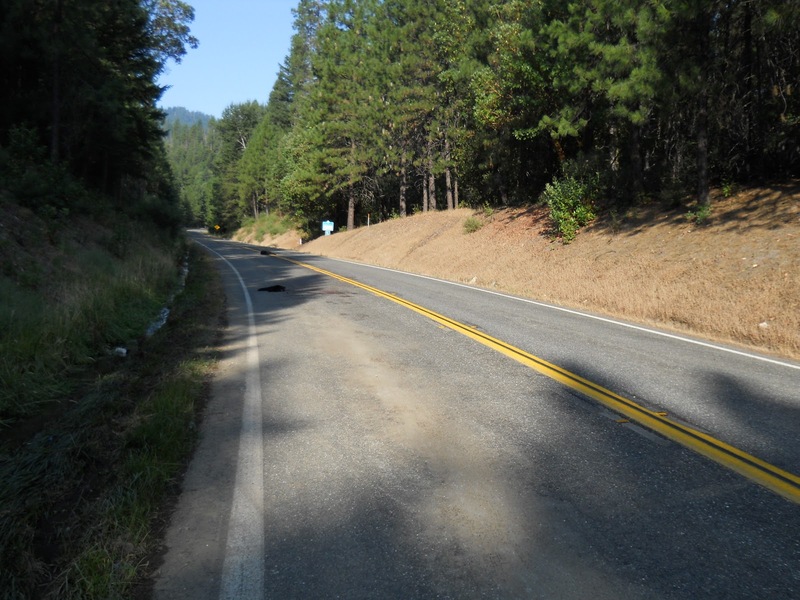 Originally, the plan had been to meet her where the road comes out near Interstate 5--a straight shot into Ashland from there. With my shoe causing so much trouble, however, I told Amanda to go ahead and try to find me at an earlier road crossing if she got into the area early if for no other reason than to give me a different pair of shoes to hike the last several miles to the I-5 crossing. I hadn't talked to Amanda since leaving Seiad Valley--my cell and e-mail hadn't worked at all in the better part of a week now. As I got closer to Ashland, though, I hoped for a signal. I hoped Amanda could find me at an earlier road crossing, perhaps by Mt. Ashland Campground, so I could switch out the shoes. They were killing me. I came along a 'soda cache' near one dirt road, where I stopped for a half hour to read the register, drink a Pepsi (that was the only choice available), and rest my aching feet. Actually, my ankles were the part that hurt the most. The first couple of days, it was the bottom of my feet. The leaves I stuffed in the shoes seemed to largely fix that problem, but now my ankles--and especially the left ankle--felt like it was in a vice. Except for cutting the tops of the shoes shorter, I didn't have any other ideas about what to do about that. The register was a little more interesting to read than most. 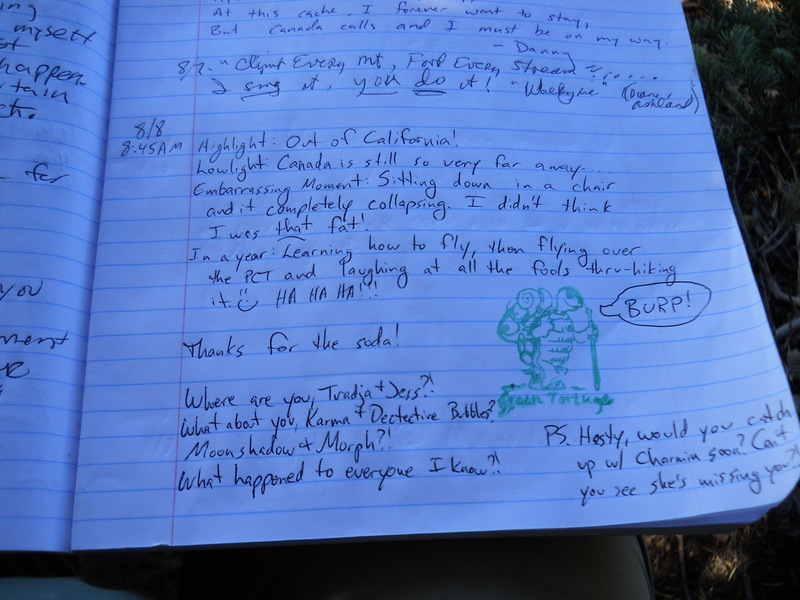 The person who left it asked people to write a highlight of our hike, a lowlight, the most embarrassing moment, and what we expected to be doing a year from now. Most of the answers weren't particularly interesting, but they were still fun to read anyhow. I wrote that my highlight was being out of California, the lowlight of Canada still being so very far away, and then I was stumped with the most embarrassing moment. I tried to think of something that happened on the trail that was actually embarrassing, hmmm, how about buying $15 shoes at Payless and having them fall apart within 24 hours! And for what I'd be doing in a year.... I'd learn how to fly a plane, then fly it over the PCT and laugh at all those fools thru-hiking the trail. MUHAHaHahaha!!!!! A short time after that, I finally got a signal on my cell phone and gave Amanda a call. The news was bad.... the car experienced some mechanical problems during the drive down to Ashland and was currently being worked on, but it should be fixed soon (mostly fixed, at least), and she'd meet me at I-5. I called her again when I could see Callahans Restaurant down below, alongside I-5. 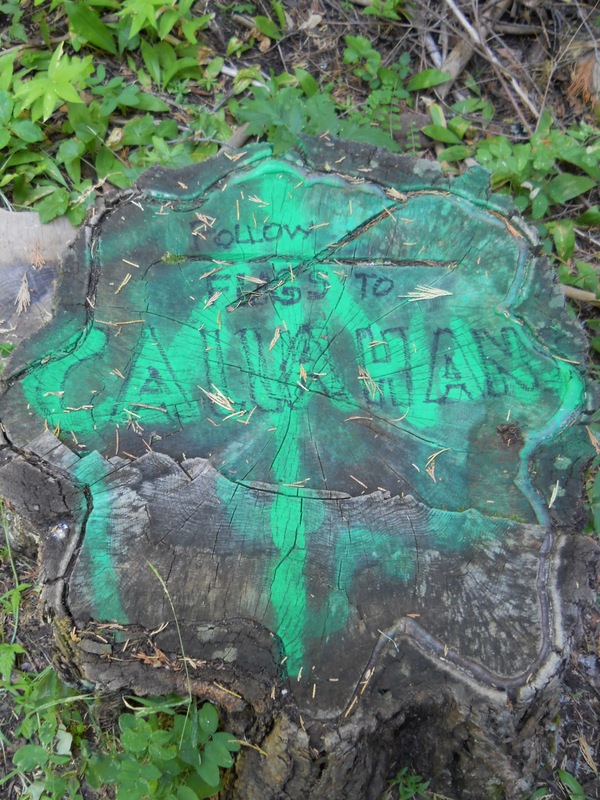 Most hikers take a shortcut down from the PCT to Callahans. I knew Amanda would be waiting for me, though, and didn't need the side trip. 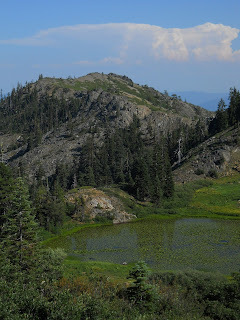 But seeing the restaurant meant I was less than a half mile away from the trailhead, just around the proverbial corner, and I called Amanda to let her know that I was ALMOST THERE! Might take me an hour as slow as I was limping at this point, but I was almost there! Amanda tried following the PCT south a short ways--part of her Hike-a-Thon efforts, but lost the trail where it crossed a short paved section of road. So I started describing where I was, the twists, the turns, the road crossings. "Yes! That's where I was when I lost the trail!" I was still talking to her on the cell when I turned the last corner and saw her by the car. But I didn't want any shoes at the moment. I wasn't hiking anymore today, so I pulled off my shoes and used the Waldies from my pack. My feet and ankles still hurt to walk around in even without the shoes on--the damage was done and they'd need time to heal. But never again would I put those horrible shoes on my feet again. I wanted to nail them to a tree as a warning to other misbehaving shoes, but I'd settle for throwing them in the trash never to be seen again. It was still early in the afternoon and we called the Super 8 to find out if we could check in early and got a definite NO, so we drove into town looking for a place to eat rather than a place to lodge, settling on Señor Sams. And over Mexican food, we swapped war stories of the last four days--mine mostly consisting of the miserable shoes, and hers consisting of car problems. We finally arrived at the Super 8, checked in, and went to our room to discover that it hadn't actually been cleaned yet. Don't they keep track of this stuff? We went back to the lobby of the hotel to wait while it was cleaned. My stench filling up the lobby, I was certain, would get us an expedited cleaning. =) About 20 minutes later we were told we could go back to the room, where I finally took a good, long shower and got online. 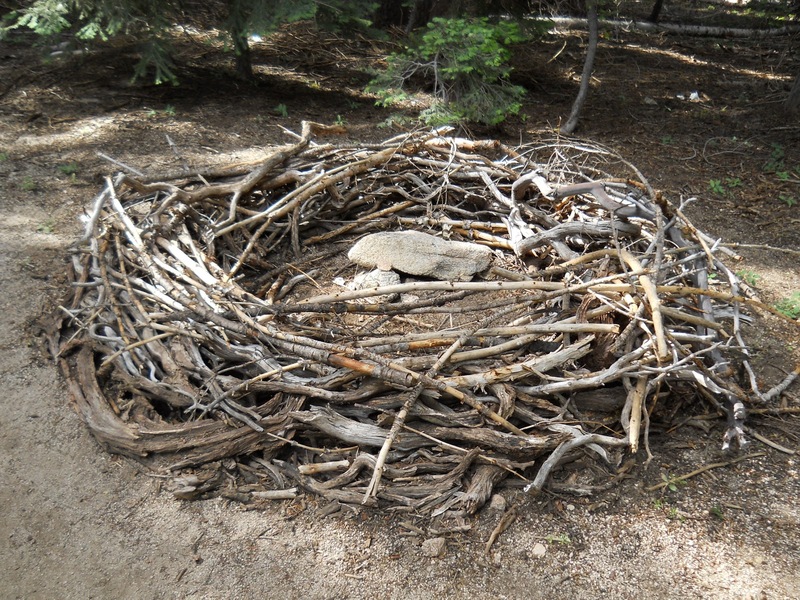 This bizarre, human-sized nest was alongside the trail. For dinner, Amanda and I headed off to the Great American Pizza Company. We posted that we'd be there for dinner if any letterboxers wanted to join us or make fun of my beard. We hadn't gotten any response to the suggestion (no positive ones, at least! ), but we went to the pizza joint anyhow because we did need dinner. Why not? Interstate 5 crosses over the trail on this bridge. O Oregon, Where Art Thou? Sunrise from camp--and, I hoped, my last California sunrise! August 7: I woke, broke camp, and started hiking. I couldn't go more than about ten minutes before I stopped, though, my feet in agony from the shoes. They were still padded with leaves which I'd been refilling periodically with more leaves throughout the day, but leaves were a lot more scarce above treeline. And they didn't seem to be helping as much anyhow. My left shoe was starting to cause a lot of pain around my ankle in particular, so I pulled out a knife and made some 'surgical enhancements' to the shoes, cutting off a large chuck that made up the top of the shoe around my ankle. Maybe I would be better off hiking barefoot, I thought, but I limped on. The surgical enhancements helped considerably, but it was only a delaying tactic. I needed new shoes, and badly. Strangely, despite only doing the cutting on my left shoe, both of my feet seemed to feel a little better--a rather unexpected (but positive!) benefit. I'm not sure why, but I guess the pain in my left foot was so bad, it caused me to favor my right foot, or at least walk strangely enough, that it had been causing my right foot undue pain as well. Whatever the case, though, the cutting of the shoe made things a heck of a lot better, and I wished I had thought to do that sooner. I was in cowland by now. Often times, I couldn't even see the cows, but I knew they were nearby because I could hear cow bells. Clonk! Clonk! I don't think I'd ever seen a cow wearing a cow bell before, and at first, I thought it was kind of amusing. Cute, even. But hearing those cow bells off in the distance all day long, it started to get annoying. How do cows live with that noise all of the time? Clonk! Clonk! I'd be walking through a large patch of trees, and I wouldn't be able to see any cows, but I could hear them among the trees. Clonk! Most of the day was largely above tree line, however, with nice views if it wasn't for all of the smoke on the horizon. I still couldn't see any fires or smell the smoke, but it was getting thicker with each passing day. It was largely a lonely day of hiking as well. For the third time in a week, I saw no other thru-hikers the entire day. The only hikers I saw the whole day consisted of one section hiker going southbound early in the morning, and two more southbound hikers out for the weekend late in the day. Despite the pain in my feet, though, I was in a good mood. Oregon was just ahead. Nineteen-or-so miles ahead. 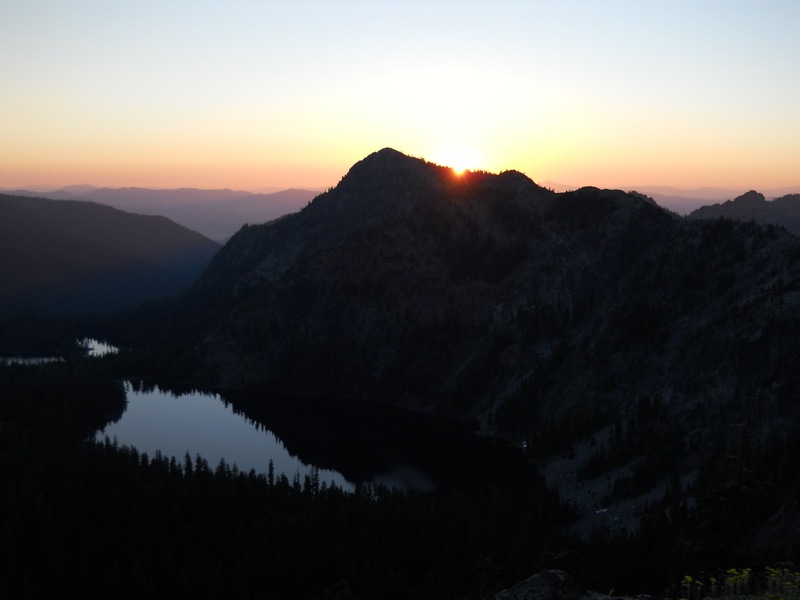 If I could limp through the pain, I'd be watching my next sunset from Oregon. OREGON! OMG! It seemed almost impossible to think I'd finally be out of California. The state that would never end. The state that tried so hard to kill me with snow, ice, water, lack of water, mosquitoes, venomous snakes, freezing temperatures, boiling temperatures, road walks, altitude sickness, lightening--it was all behind me.... almost! I'd never been so excited to leave California behind. Good riddance! no idea where the fires were or how bad they were. A mile or so before the border, I started keeping an eye open for the border. 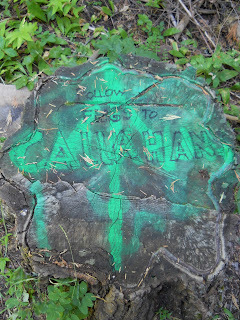 It had been described to me as a small sign nailed to a tree and easy to miss. By golly, I was not going to miss it! So about a mile before I expected the border to be found, I started taking a close look at every tree along the trail for the small sign. The trail dipped into a meadow, and crossed a bridge, then climbed again past an old structure that looked like it could have been someone's home a hundred years ago. I worried a little that maybe I walked across the border already and didn't realize it. I looked at my watch--no, I don't think I would have passed it yet. But it should be close, and I shuffled along. Or rather, limped along. The pain I'd largely alleviated by cutting up my shoe in the morning had returned with a vengeance. Late in the afternoon, I stopped and cut off some more, but the additional cuts didn't seem to help anymore. "Where are you?" I thought. "Those hills to the north? Is that you, Oregon? Come out, come out, wherever you are!" How far away to the border? Minutes? Seconds?! It's around here somewhere! that sign on the trail is Oregon!!!!! I looked up the trail and saw a sign and a kiosk. I was too far away to be able to read it, but I knew it was the Oregon border. I stopped suddenly, slightly stunned and surprised even though I had been expecting it, my breath stuck in my throat, tears forming. This was it! THIS WAS IT!!!!! I made it!!!! I took a big breath, blinked the tears away, whipped out my camera, and took a photo. My first photo of Oregon. 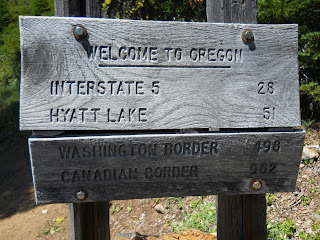 Technically, not my first photo in Oregon--I was still gaping, awe-struck, on the California side of the border. 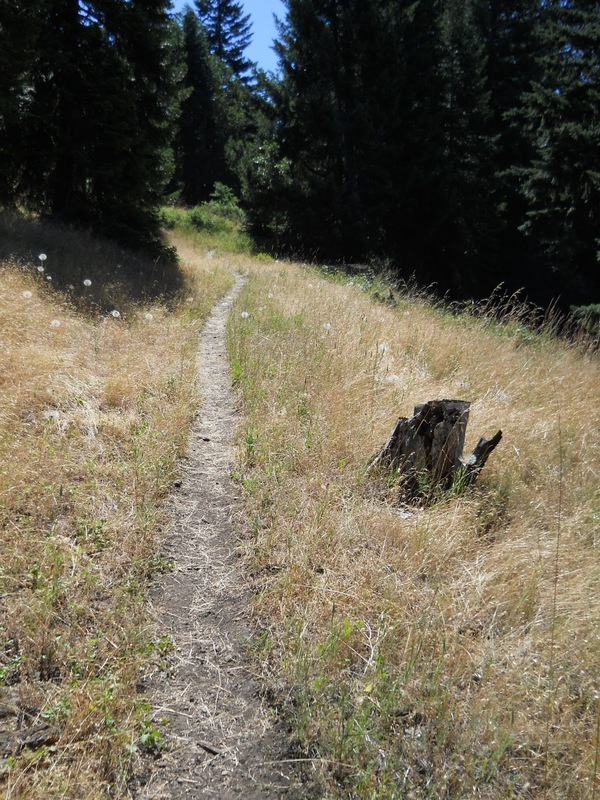 Then I started walking, slowly, savoring every last step to Oregon. I walked up to the sign marking the California/Oregon border, looked at it for a couple of seconds, then reached out and touched it. HA! I MADE IT!!!! I spent about a half hour at the border, reading the register. My worries about walking past the border and not even realizing it were completely unfounded--there was a large, impossible-to-miss sign along the trail and a box containing the register. 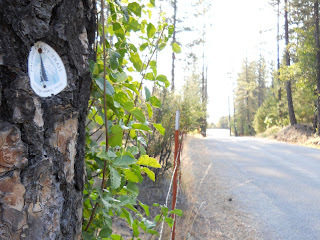 A couple of small signs were nailed to the tree marking the border as well. I took pictures of them all! 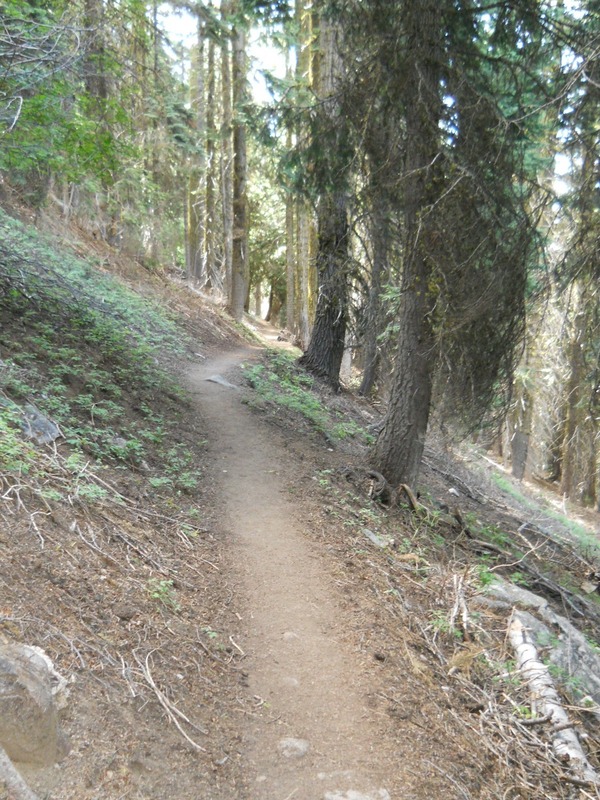 While sitting on the trail reading the register, I could still hear cow bells clanking in the distance. I wondered if they were California cows or Oregon cows. Sounded like California cows, but I could be wrong--I couldn't actually see any cows among the trees. I sighed. Only the cows were witnesses to the end of my 'California thru-hike.' But I didn't care, I was elated to finally reached this point. A stupid, political boundary, but WOW! What a boundary! According to Erik the Black's distances, I had now traveled 1703.2 miles since I left the Mexican border. And still had 953.0 miles left to go.... Which was a milestone in itself--less than one thousand miles to the end! Finally, I put the register back, and continued limping along. 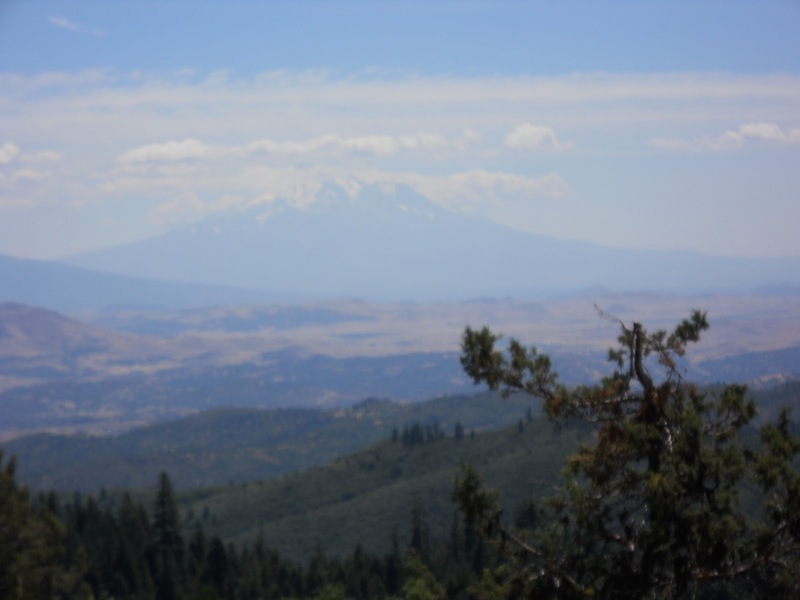 I stopped to camp for the night at Siskiyou Gap, alongside a dirt road. 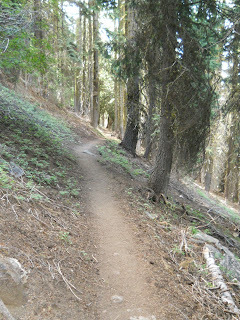 The road had several cars going up and down it during the evening so it wasn't very remote, but the elevation of the trail dropped dramatically after the border and more and more of it was in the trees. Alongside the road it was clear of trees and I had hoped for a nice night of stargazing. The beard is starting to grow in too. August 6: The next morning, my feet still hurt. A lot! 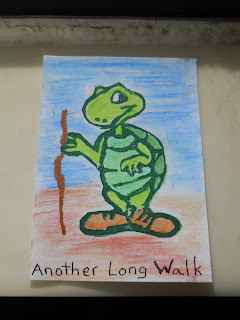 Usually, even if my feet are sore at the end of the day, they're usually feeling back to their normal soreness by the next morning, but my shoes were crippling me. Seriously crippling. I did stuff them full of leaves for extra cushioning, however, and I hoped that would help. At one point, I had something to contribute to the conversation and tried to get in a word, but I couldn't. Her words came out like a rapid-fire machine gun, and I'd try to cut in and say, "Yeah, and--" and I didn't get past the "Ye-" before she drown out the rest of my sentence. Holy cow! Stick looked like he was having a miserable experience, and I tried to ask him if he camped there for the night. He nodded, sad and clearly miserable. Poor guy. In a situation like this, however, it was every man for himself. I escaped... barely... walking down the dirt road into Seiad Valley. I never saw Stick again after that. I don't think he made it out alive, or perhaps was so damaged by the experience he had to quit due to psychological injuries. but those were temporary and not official PCT tread. The road walk into Seiad Valley wasn't too bad most of the way. It was an eight mile road walk, and walking on the flat road seemed to help my feet some. It started off dirt, then eventually turned onto a paved road. No cars passed me the entire time--two thumbs up for that. The last mile or two grew increasingly worse, however. It started getting into civilization. A couple of houses had dogs running loose and not looking at all friendly and they barked, growled, and showed me what big canines they had. I picked up a few rocks to throw at stray dogs as needed and kept my trekking pole at the ready, but never ended up needing to use them. 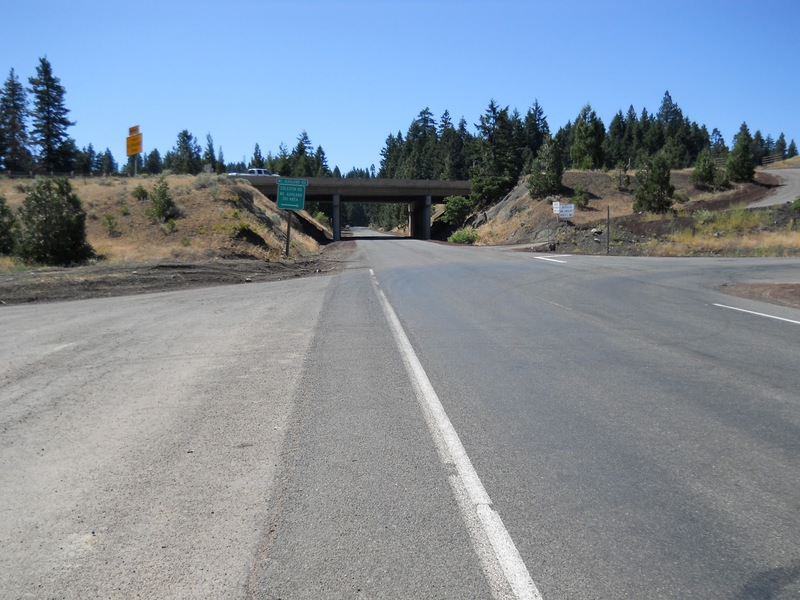 Then the trail turned onto Highway 96 where the road walk officially turned miserable. It was a busy road with lots of fast moving traffic. Ahead, in the distance, I saw two lumps on the road. Probably road kill, I thought--that could be me if I'm not careful! As I got closer, the lumps got bigger. And the lumps were black. And I started thinking, bears? 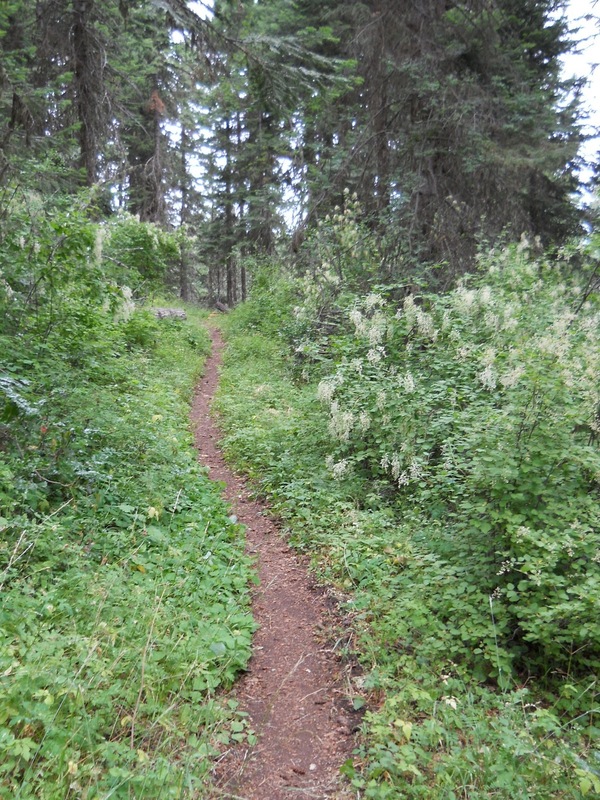 Could I finally be seeing my first wild bears on the trail? (Remember, I did see a couple of bears in cages in Southern California that were used for films and such.) Road kill wasn't my idea of seeing wild bears, though. And when I finally got close enough to see the details, it broke my heart. The two lumps were bears--a mama bear and her cub, run down and splattered across the road. Seeing the cub was heartbreaking. What massacre happened here? How did both of them get run down? I imagined they were crossing the street and one of them got hit. Maybe it was the cub, and the mama bear, grieving, wouldn't leave her baby's side and ultimately met the same fate? Or maybe it was the mama bear who was hit and killed first, and the baby wouldn't leave mommy's side--ultimately getting hit by a second car. come across. I won't show closeups of this scene! This is as close as I was willing to even take photos. It was the most heartbreaking case of road kill I'd ever seen in my life. So I was feeling a little sad when I finally walked into Seiad Valley. Walking into town was supposed to be a time for celebration, but I was depressed. 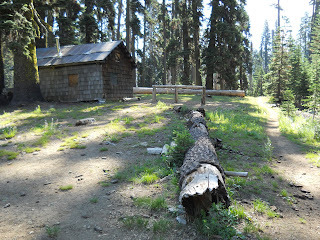 Seiad Valley was the last trail town in California. The damn state that tried so hard to kill me was almost behind me. I should be happy, but I wasn't. If you read all the signage in this area, you might think you were already out of California. Support for the State of Jefferson was everywhere. "But Ryan," I hear you thinking, "There is no state named Jefferson." Yes, I know that, but there are a lot of people in the north part of California and the southern part of Oregon who want to secede from their respective states and form a new state called Jefferson. Crazy, you say? Absolutely! But they keep their own website to promote their cause, but I like the description on Wikipedia better. They have a flag--an ugly one, in my humble opinion--which has two Xs askew from each other, known as the "Double Cross" to represent their sense of abandonment by the state governments of California or Oregon respectively. These double crosses could be seen everywhere while walking into town. Some folks had flags flying. A lot of the graffiti included the double cross. 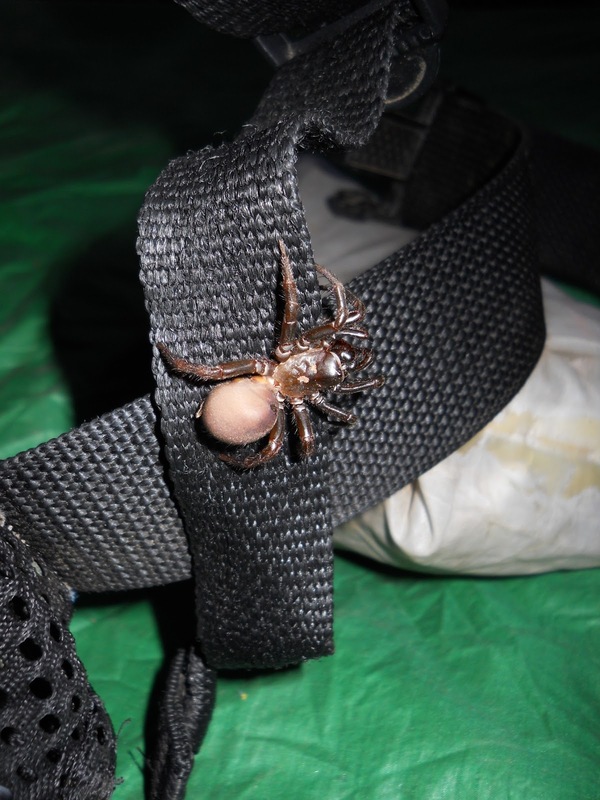 It had something of a redneck feel to it that made me uncomfortable but seemed relatively harmless. I found the entire town in a single building along the right side of the road. The post office, general store, and restaurant shared the same building--the whole town (at least as far as public facilities that I wanted to use went), tucked away in a single building. I started with the post office, picking up a maildrop and sending some postcards. I transferred the food I had sent myself into my pack. I also had a package from my mom with the guidebook for the Oregon section of the PCT. Unfortunately, I did not ask her to send me shoes--when I left from Etna Summit, I had no idea I'd need another pair of shoes 48 hours later. sign hanging above the building if you look real close. I did, however, call Amanda from the payphone. I was still planning to see her in two days in Ashland if all went well, and I asked her to bring an extra pair of my shoes that she had at home. It would be the quickest way I could replace my current shoes. My mom had several pairs of spare shoes to ship me as needed and Amanda usually didn't have any spares--with her flying around the country all of the time, depending on her for shipping maildrops isn't normally a good idea. Amanda did happen to have one pair of used shoes, however. 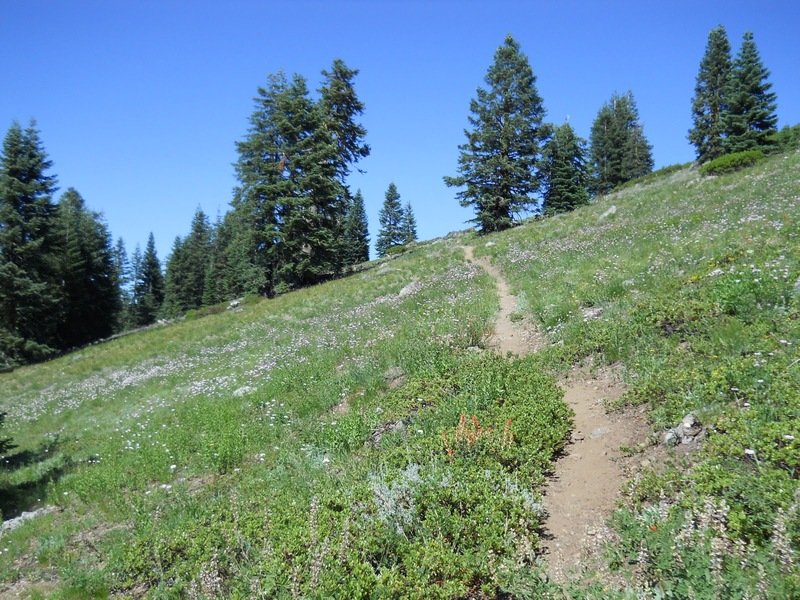 When I arrived at Kennedy Meadows and was preparing to go into the High Sierras, I switched out my shoes for a sturdier pair. Since Amanda had come out to visit, I gave her the pair I switched out to take home. The shoes already had a couple of hundred miles on them, but by golly, I wanted them back now! So I called her asking her to bring the shoes back with her when she drove down to Ashland. Then I headed into the general store where I poked around to see what they had. 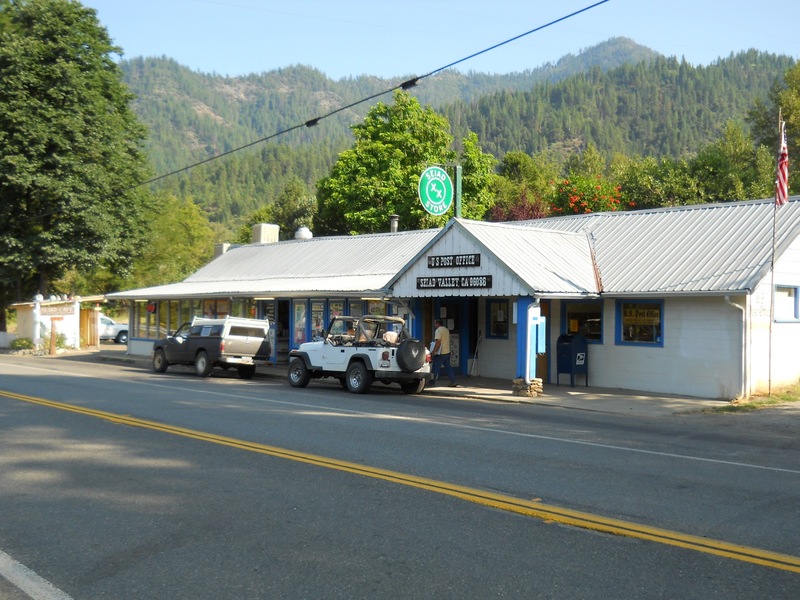 I didn't really need any food--I had that covered with the maildrop I sent myself from Yreka--and the selection there was disappointing anyhow. 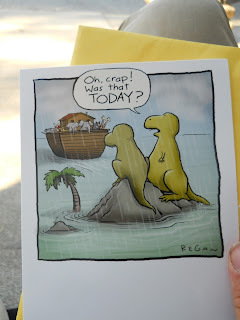 I did buy some more postcards, however. While checking out, the guy behind the counter asked who I was. "Green Tortuga," I told him. "No, I mean your real name." mom to include with each of my maildrops. That was weird.... "Ryan" I told him. He looked back at an envelope he had. "Ryan Hastings....?" And he explained that he had a package for this Hastings fellow, who I actually happened to know was better known as Hasty on the trail, and the ETA date written on the package was for the day before. "Well," I told the guy, "I have no idea how far behind me he is, but I *do* know he's still behind me because he hasn't been picking up the notes that Charmin left him on the trail. You haven't missed him yet!" 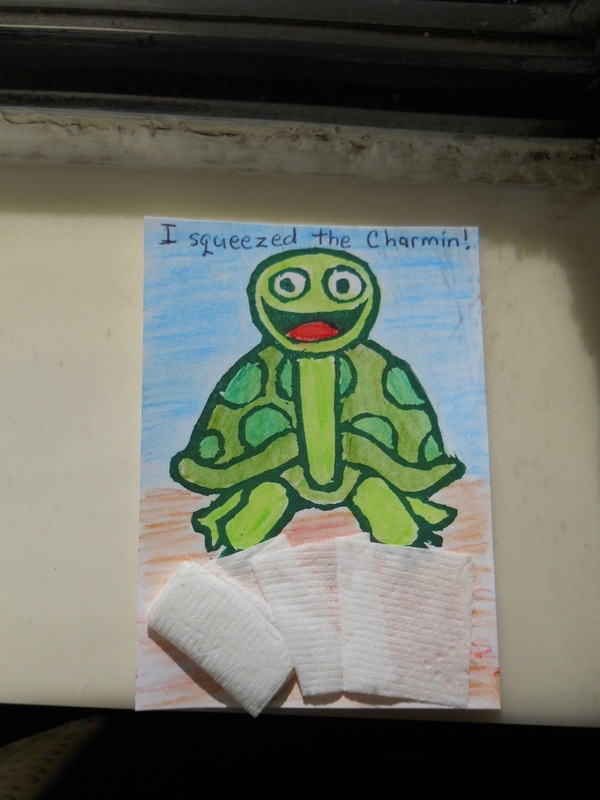 Not that the guy would have any idea who Charmin was. Or maybe he did--she signed the register in the store just the day before. Then I headed into the small diner famous for the Pancake Challenge. Those who can eat five pancakes in 45 minutes get their meal for free. Sounds simple--until you learn that each pancake is one pound heavy. Stories of gluttony and extreme bowel movements were legendary. 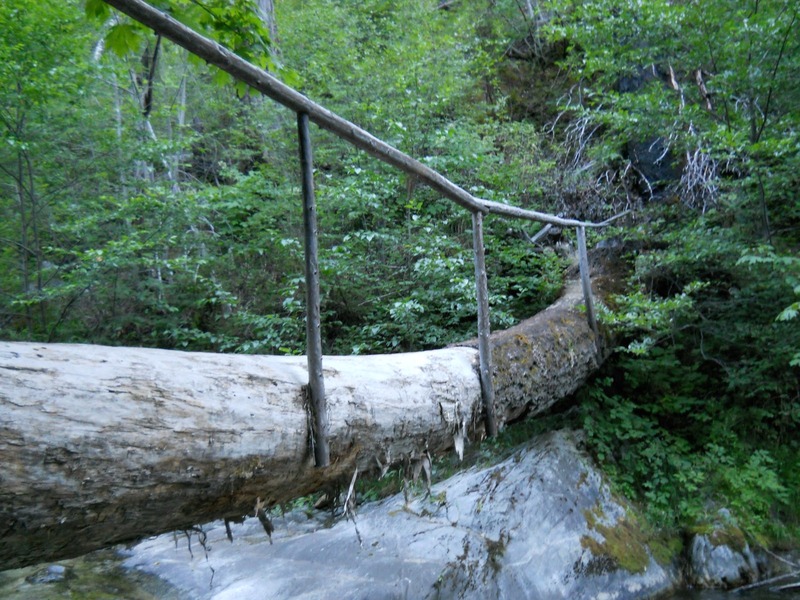 There are warnings that anyone who attempts this challenge should not, under any circumstances, plan to do anymore hiking for the rest of the day. And if you fail--it'll set you back $13 and change. The rumor I heard on the trail was that only 19 people have succeeded in the decades the challenge has been in existence. On average, one person each year succeeds. From a statistical standpoint, the Pancake Challenge is tougher than thru-hiking the entire PCT. The success rate for thru-hikers is hundreds of times higher than the success rate for the Pancake Challenge. I had no intention of taking on the challenge myself. Pancakes really aren't even my favorite breakfast food to begin with. (I'd much rather dig into waffles or French toast.) I hoped to meet another hiker who would attempt to take the challenge, if for no other reason than I could get a photo of those gigantic, head-sized pancakes. But strangely, I had not seen a single hiker in the entire town. Stick, presumably, couldn't be very far behind me, but even he was MIA at the moment. Seiad Valley, looking down from the trail. a wildfire nearby, but no idea where or how bad. So I would never see anyone attempting the Pancake Challenge. I, however, took on the "burger and fries" challenge, a less noteworthy attempt at eating a burger and fries. I succeeded, but I still had to pay for my meal and absolutely none of the other diners were impressed with my feat. I don't have any pictures myself of the Pancake Challenge, but I did a Google search since I figured you might be curious to see the photos and found this blog entry with photos of the pancakes near the end of the post. Bon Appétit! Having visited the entire town, I picked up my pack and continued my trek. The trail followed the highway another mile or so out of town before ducking into the trees for a grueling 5,000-ft climb out of Seiad Valley. The updated weather forecast I got in town expected temperatures in the high 90s, and was supposed to break 100 the next day. It was another scorcher of a day, but it would cool as I climbed in elevation. 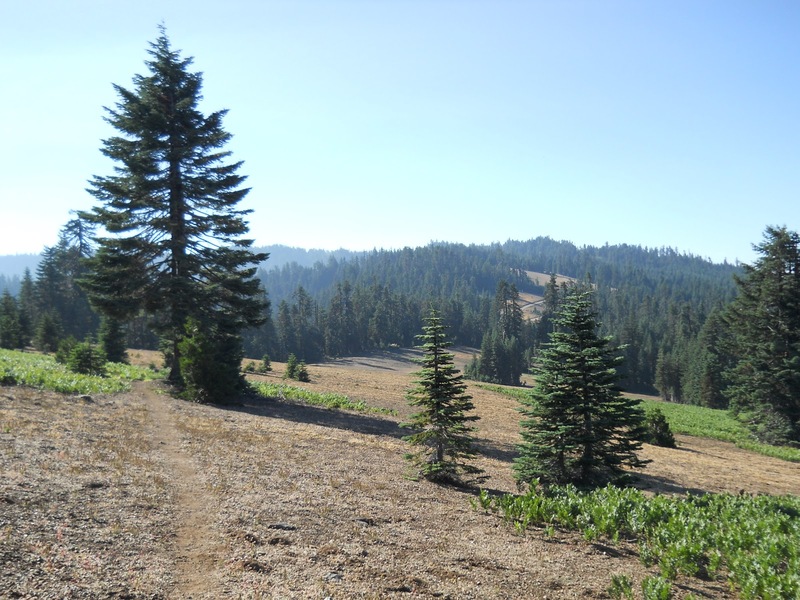 At 4 degrees per thousand feet, I could expect it to be a full 20 degrees cooler at the top of the mountain ridges. Getting there, however, would be a grueling climb. 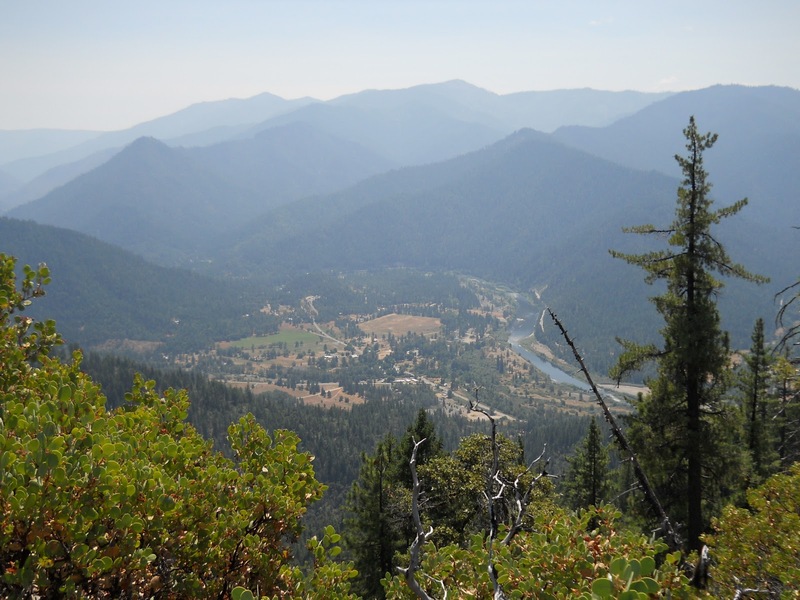 After climbing a few thousand feet, the trail finally burst free of the treeline and the spectacular views returned, including one overlooking the town of Seiad Valley. I followed my path through the town, identified the building that was home to the post office, general store, and cafe, and it seemed really astounding that I was able to hike all that distance in just a few hours. With horribly painful shoes to boot! As the day wore on, the pain in my feet seemed to grow exponentially. 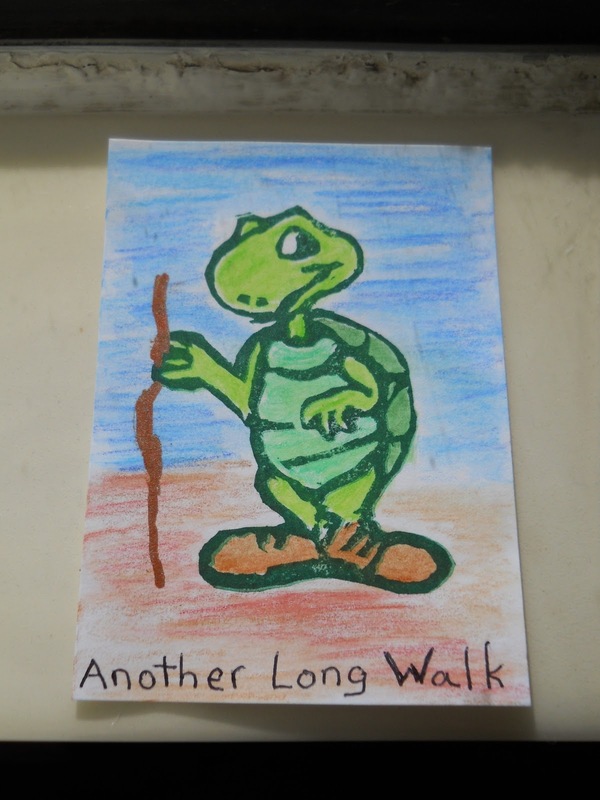 I couldn't walk without limping anymore, and I stopped for rest breaks more often. 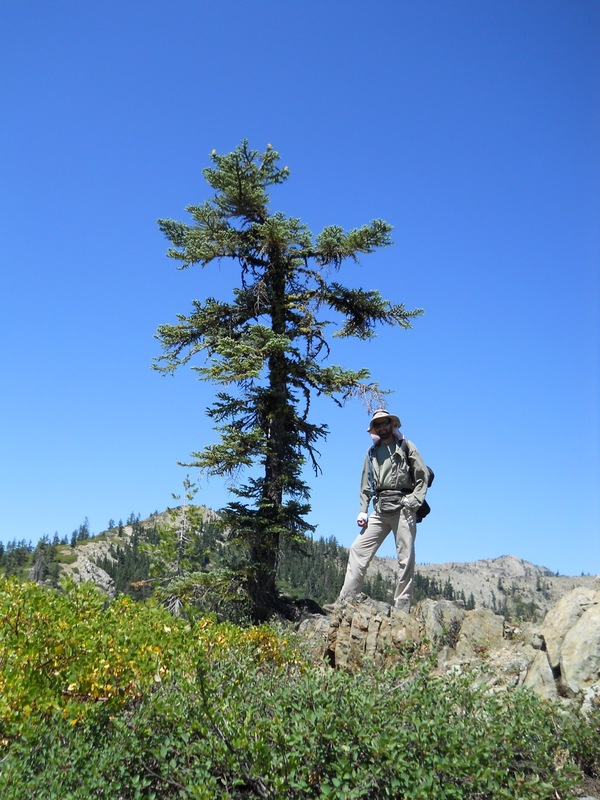 Back on the ridgeline--where I belong! 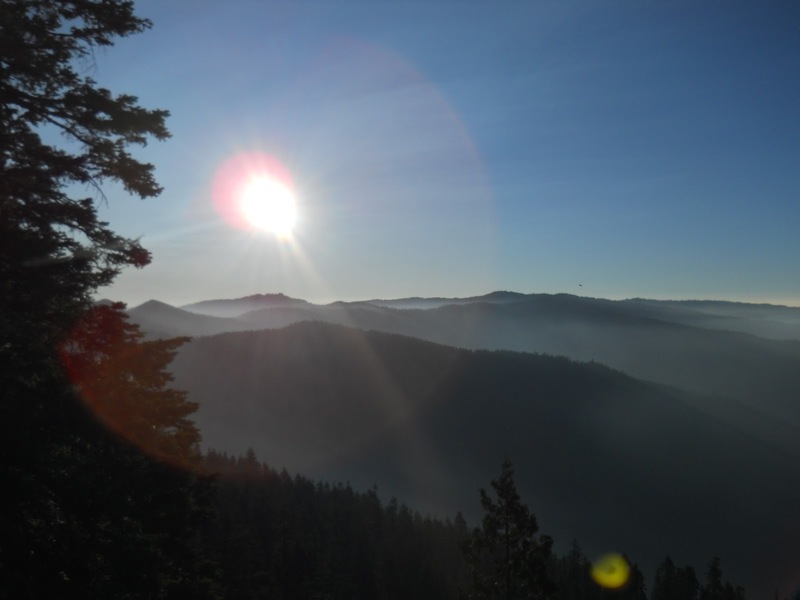 The views did have one significant problem--haze. It was very hazy out, and I'd seen a few aircraft trimmed with fire-truck-red colors flying surprisingly low which made me think they were probably used for fighting wildfires. I couldn't see any wildfires or even any obvious signs of smoke rising off the ground, but given how hazy the views were, I suspected wildfires somewhere nearby. I crossed my fingers and hoped they weren't on the trail ahead. Lily Pad Lake seems appropriately named! August 5: It was bound to happen eventually--a bad pair of shoes. After less than 30 miles of hiking, my new shoes had fallen apart worse than those I wore for 700 miles. Shoddy piece of junk. Yes, I know, a lot of you are probably thinking, "Serves you right for buying shoes at Payless!" But in my defense, you can buy bad shoes just about anywhere. I've traveled thousands of miles with Payless shoes without problems, but these shoes took the definition of a bad shoe to levels I never imagined existed. Not only were the shoes quickly falling apart, but as they did so, my feet hurt worse and worse. Each step was a painful experience. Blisters started to form for the first time in months. I slapped moleskin on in the appropriate places and pushed on. What else could I do? What I really wanted to do was hurl them through the front window of the store I bought them, but that was hard to do from the middle of the Marble Mountain Wilderness. And, as bad as the shoes were, it was still preferable to walking barefoot! 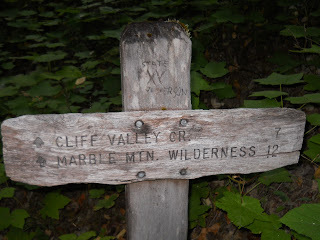 For the second time in less than a week, I didn't see a single thru-hiker the entire day. In fact, I almost didn't see anyone for the entire day--it wasn't until about five in the afternoon when I passed a couple of southbound hikers. 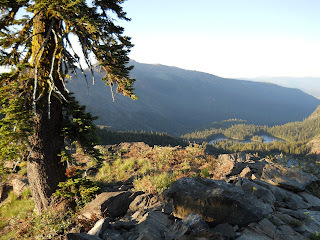 Late in the day, the trail dropped dramatically, thousands of feet, down towards Seiad Valley. Until then, the views--once again--were spectacular. 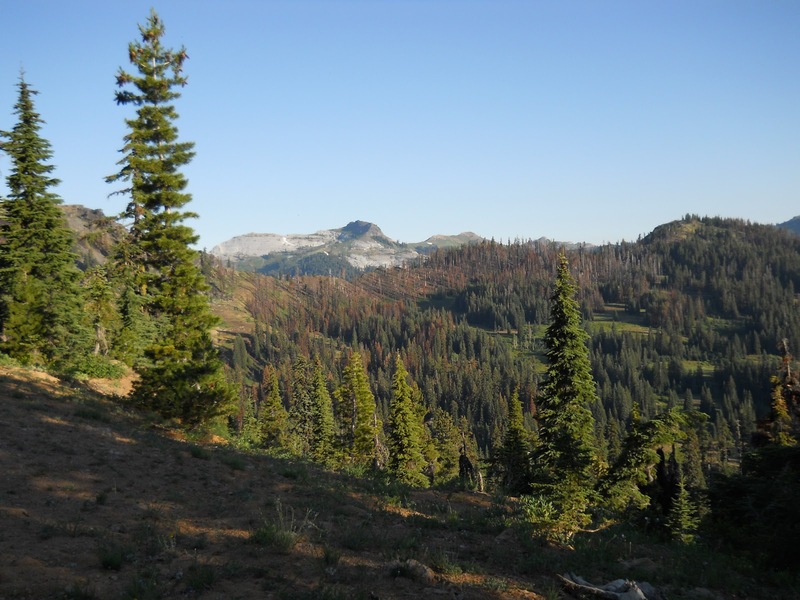 Once below treeline, however, the views vanished and the bugs started flitting about in large numbers. Not a good sign so early in the afternoon. And as the elevation dropped, the temperature rose. Without a thermometer, I could only guess, but it felt like it must have been above 90 degrees. And deep in the trees, there wasn't the slightest breeze to help stay cool. The shade helped, but I'd have traded the shade away for a nice breeze. I camped at the junction with Grider Creek Trail--an absolutely awful campsite thick with bugs. 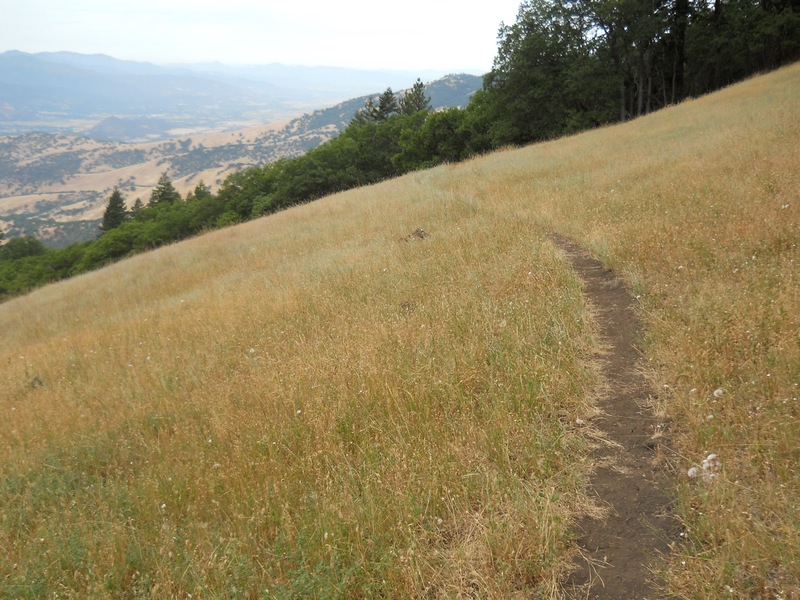 I checked my topo map hoping to find something better somewhere ahead, but there was nothing. The trail followed alongside the creek for miles--no way to avoid camping near the water. The tree cover continued for miles--nowhere ahead to find an exposed ridgeline. 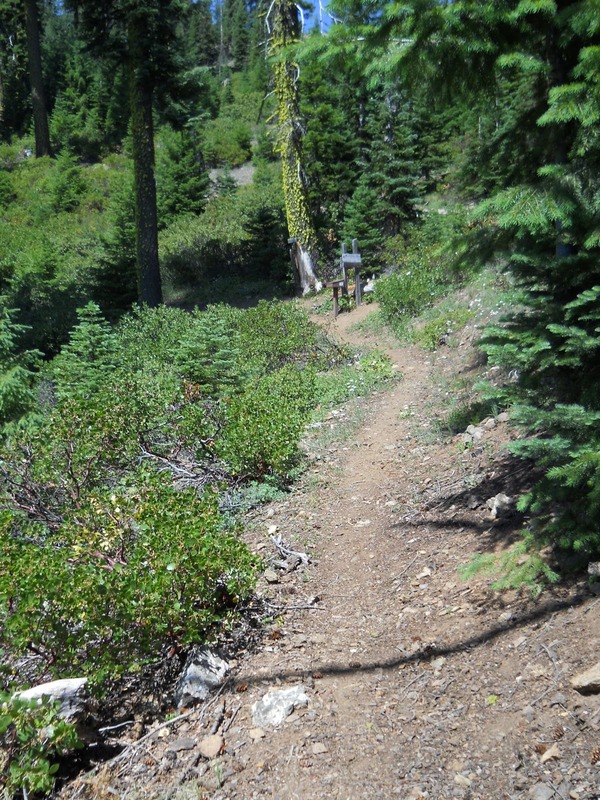 Even campsite options were limited on the steep slopes the trail went down. So I grudgingly camped by Grider Creek, lathered myself with DEET, massaged my poor feet, and examined my shoes for ways to keep them going. Remarkably, I managed to pull off 29.8 miles despite the shoes. That's quite a testament to the resiliency of my feet--earlier in the morning, I had concerns if I could even make it 20 miles. I still needed to push myself hard if I was going to meet Amanda in Ashland in four days, though. A guard station, which looks pretty abandoned. The padding inside the shoe had completely collapsed, and I could feel huge lumps inside the shoe--each lump painful to walk on. I stuffed a bunch of leaves into my shoe for additional padding, and worked more leaves into the cracks of the sole to fill up the hollow spaces with something of substance--try to even out those ridges causing so many lumps in the shoe. Ironically, just by looking at the shoes from the top, they looked sparkling new. A little dusty from the trail, but they actually still looked new. Flip them over and look at the bottoms of the shoe, though, and they looked like I'd hiked a thousand miles in them. Feel inside of them and they were so lumpy, you'd assume they must have just been purely for display purposes. No way anyone could walk in those. is still patches of snow on the trail! I camped near this bridge over Grider Creek. 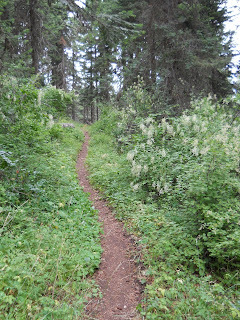 August 5: The next section of trail was long enough between road crossings that I'd have to spent at least one night in the woods. Rather than have Amanda camp out in a motel without me, we decided she should go ahead and head home. I was starting to get close enough to Seattle that it would be faster and less hassle for her just to drive out from Seattle to visit rather than flying out and renting a car. So we made plans to parts ways--for now. But she'd go back home to Seattle then drive down and meet me in Ashland four days hence. 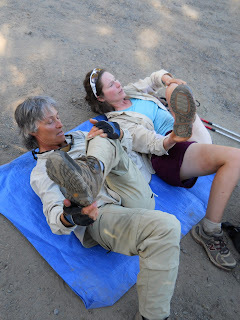 After Ashland, there were a lot of major road crossings that would allow a much greater degree of slackpacking each day. So I harvested my crops on FarmVille, packed my backpack, ate lunch at Taco Bell, called Wassamatta_u to harass him and use up more minutes on my cell phone, and finally went back up to Etna Summit to continue hiking. For the first mile or so, Amanda would join me. She wanted to do miles for the Hike-a-Thon, by golly, and there was a perfectly good trail right there! 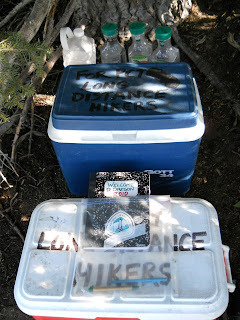 We left an ice chest with cold drinks and snacks by the trailhead for any hikers who might arrive while we were hiking. We should have left it when Amanda first picked me up but we didn't think to do so at the time. From Etna Summit, the trail climbed steadily back to the top of the mountain ridges. Although the slope wasn't particularly bad, Amanda wasn't used to them and went up slowly. I let her go ahead of me to set the pace. 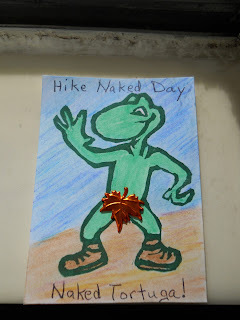 =) I encouraged her to give naked hiking a try, but she'd have none of that. "It's not so bad," I insisted. Etna Summit, but it wasn't steep. 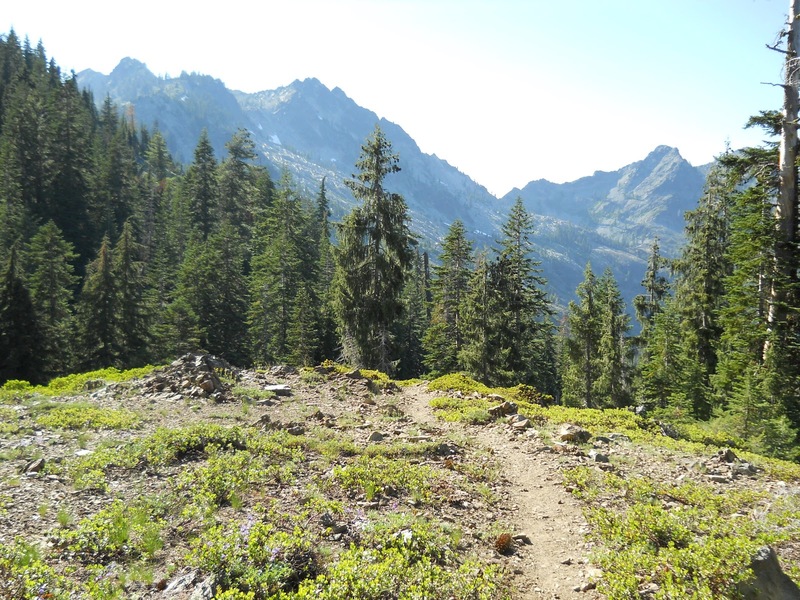 After about a mile, the trail climbed high enough to get out of the trees and to some normally spectacular views. By most people's standards, the view is spectacular, but I'd been seeing so many spectacular views, I found it a bit humdrum. It was a nice view, but we weren't on the highest ridges yet where the 360-degree views could be found. Still, a solid 200 degree view was nothing to sneeze at. We took photos, said our goodbyes, and parted ways. Amanda back to the car and Seattle. Me, pushing closer and closer to Seattle via foot. 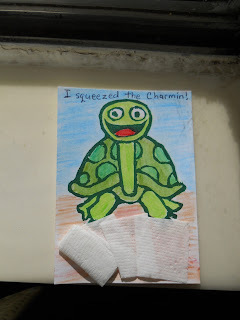 I also found another note left by Charmin for Hasty. I wasn't surprised that Charmin was ahead of me--she was ahead of me almost as soon as I went down from Etna Summit two days before--but I was surprised that Hasty hadn't caught up with her yet. 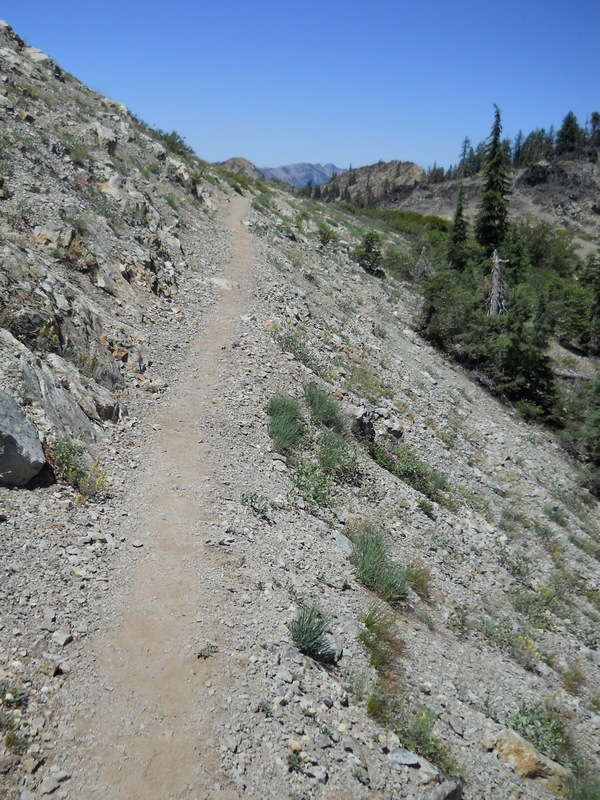 In fact, he hadn't even passed me yet, and I just took a day and a half off the trail. How far back was he anyhow? At the end of the day, I camped a short ways off on a side trail. The official PCT went through a thick pack of trees on the side of a slope and I was concerned bugs could be bad and wanted a more exposed place to camp. 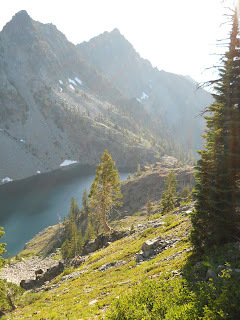 I followed the Kidder Lake Trail--which used to be the official PCT until a reroute moved it on its current path--up to an exposed ridge where I set up camp overlooking a large lake. There were a few bugs around, but the breeze kept the worst of them at bay. And watching the sunset from the top was awesome! Much better than camping among the trees. 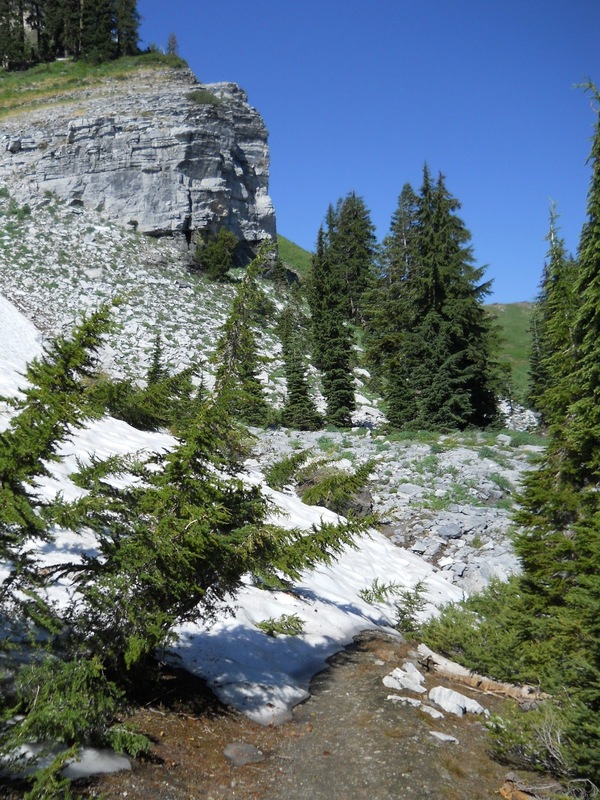 The Marble Mountain Wilderness is amazing! I decided to set up camp right next to this tree. 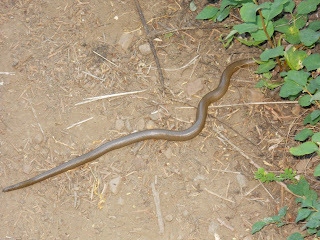 while hiking, but it arrives eventually! Nana C and the Seedlings. My most pressing concern, of course, was to resupply food, and we did that at Raley's. Surprisingly, we bumped into General Lee there--a through hiker I met briefly at the Heitman's place in Old Station. I didn't really expect to bump into any thru-hikers in Yreka since it was so far off the trail--very rarely does a thru-hiker travel that far off the trail without transportation available. I wouldn't have gone so far off trail if it wasn't for Amanda being there with the car. The second most pressing resupply concern was shoes. Those expensive shoes I bought in Mammoth Lakes were starting to fall apart quite rapidly at this point. They carried me 700 miles, but it was finally time to retire them. I should have replaced them back in Dunsmuir, but I didn't want to stop long enough to shop for shoes. I thought--or at least hoped--they would last through Etna when I expected to see Amanda again. They did, but by then, they weren't even fit for a homeless man. So it was off to the nearby Payless Shoes where I picked up a new pair that were on sale for just $15. I was pretty happy about that--even by Payless standards, that was pretty cheap. And the Tortuga bares it all! A couple of miscellaneous items turned out to be remarkably difficult to find, however--such as gloves to cut up and turn into "glovelets." My old glovelets I'd been using since Kennedy Meadows and they were wore out. I also wanted to find a new small bottle of hand sanitizer, but I couldn't find a small bottle of that stuff in several stores we checked. I finally gave up on those two items and decided they could wait until Ashland. The rest of the afternoon I used to catch up with blog entries, create a winery on my farm (stupid FarmVille! ), planted a bunch of soybeans, and used up minutes on my cell phone (which worked for the first time in two weeks!) by calling a couple of hikers. 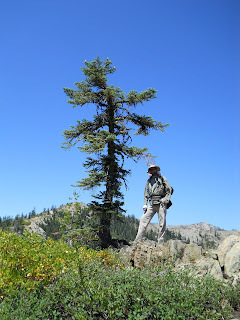 The only one I managed to get through to was Hiker 816 who I hadn't seen since Fuller Ridge. 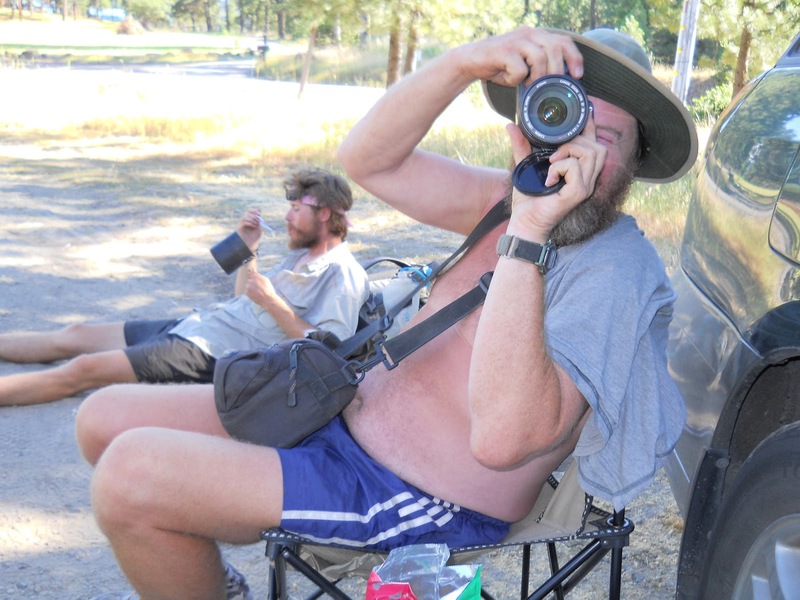 He was far behind me on the trail, but was planning to jump ahead to Crater Lake in another week where there was a good chance I might bump into him again. 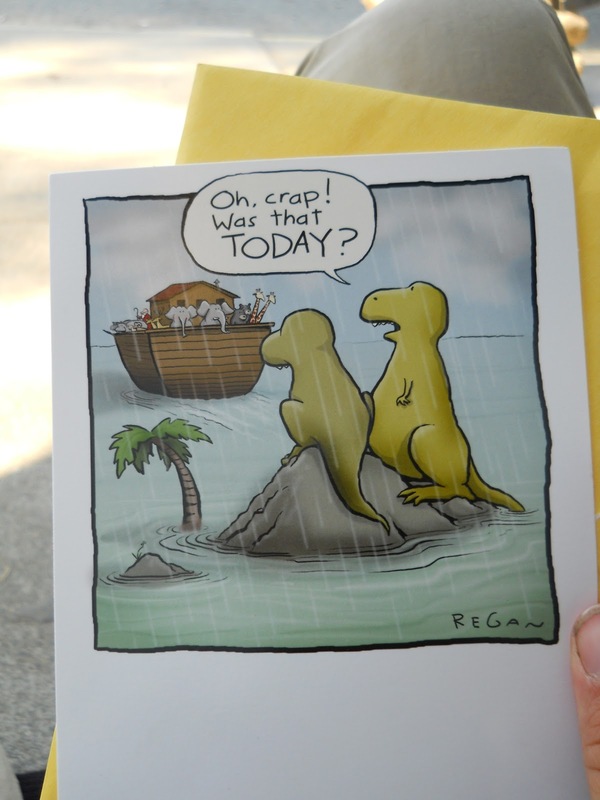 I hoped so! It would be nice to see him again. I told him I'd try calling again when I reached Ashland and find out where he was and let him know where I was. "Eeeewwww! Get those things away from me!" And that's about all that happened today. I felt a little guilty taking a zero day--it was only day three of the WTA's Hike-a-Thon, and I was slacking off by not hiking! On the other hand, I already had over 50 miles under my belt after the first two day--probably more than anyone else, and probably by a long shot. I'll make it up later, I promised myself. Amanda did go off to hike a couple of miles during the afternoon in a nearby park. I stayed in the hotel and worked on blog entries, though. What's Another Word for SPECTACULAR? Holy Naked Fisherman in a Rowboat!